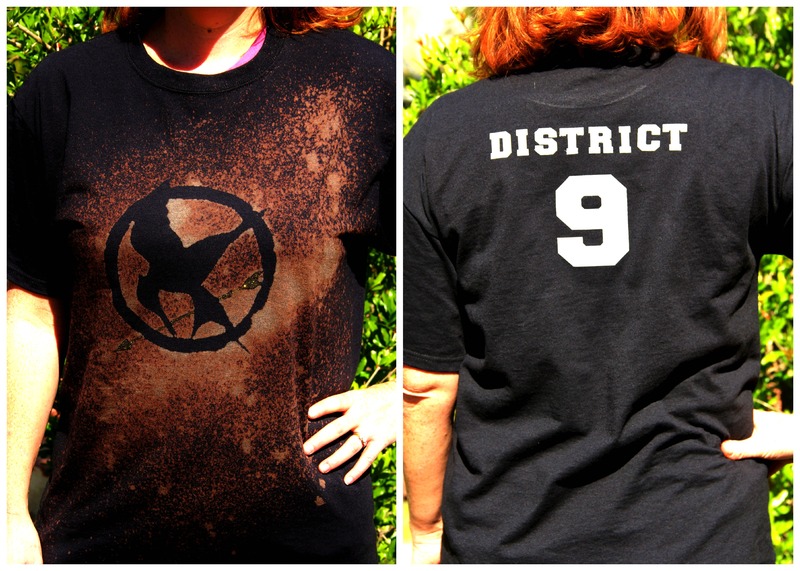 I had a blast making these DIY Hunger Games shirts with my friend Wendy several months back. However, the iron on details on the back of the shirt came off way too quickly and I was left with a mess that I couldn’t wear. Originally I simply pulled the lettering off but that ended up looking terrible so I knew I had to come up with a better fix. I wasn’t too bummed though because I never really felt that the collegiate style lettering fit the shirts anyway. 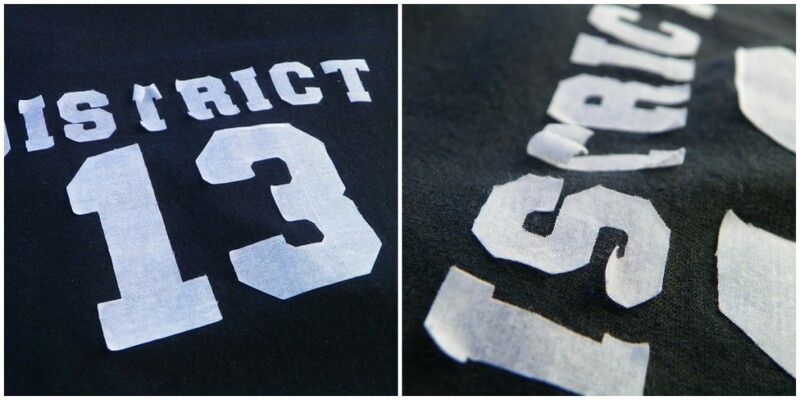 If you are removing lettering, you may have to iron the shirt to loosen the letters up a bit. 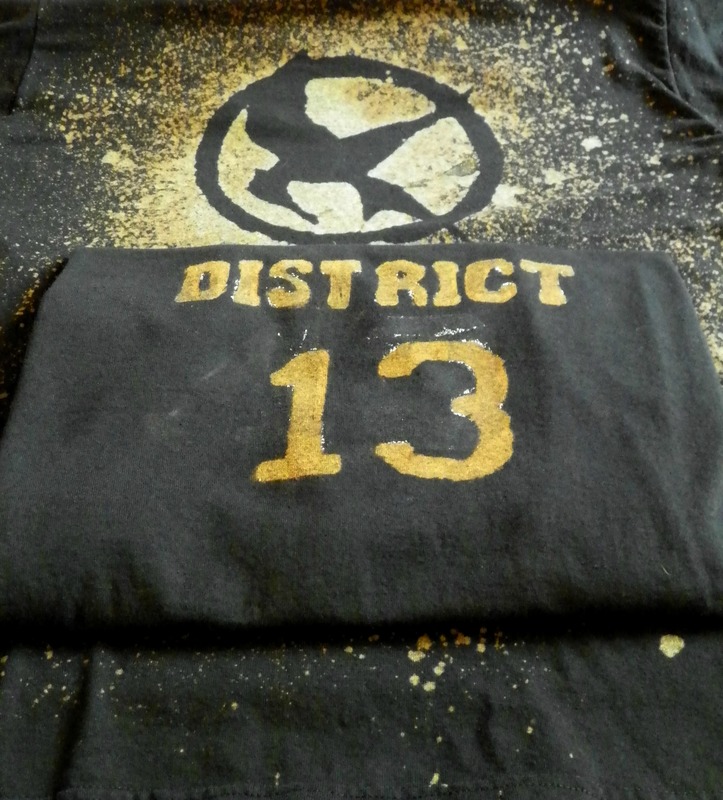 I decided to use bleach on the backs of the shirts to keep the flavor of the shirts consistent. I wasn’t sure exactly how I wanted to do this so I tried it two different ways. 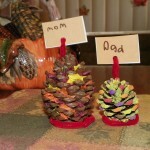 Both ways involved the same freezer paper method I used in the original post. 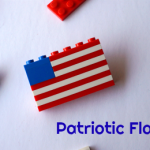 I will give a quick tutorial today, but for detailed instructions visit the original post. This is a fix for the original design, but if you are making your shirt for the first time, or adding a back to another shirt, this method will work for you as well. 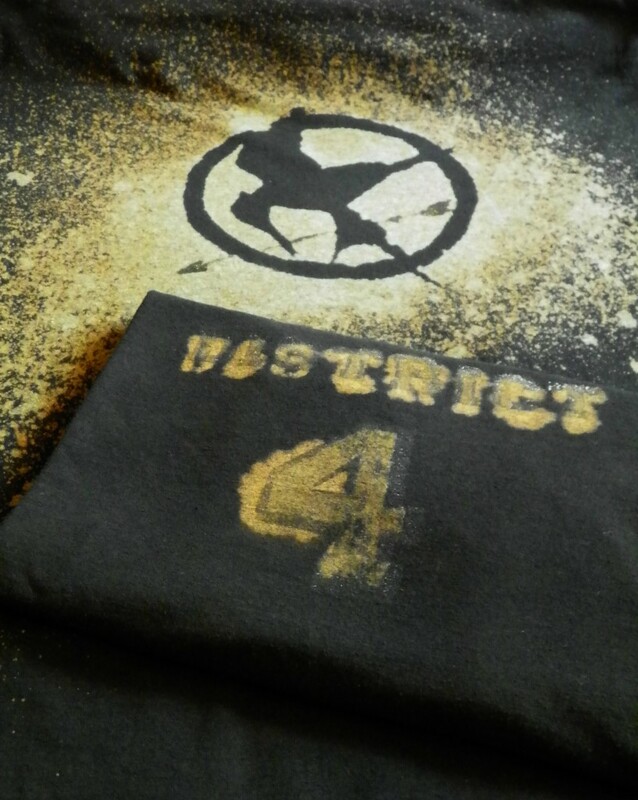 This method is the same as the one used on the front of the shirts: iron freezer paper stencil to the shirt, insert cardboard into shirt to avoid leaking, spray with bleach, remove freezer paper, and wash shirt. At first I hated the way this turned out. It looked very messy to me, especially since some of the adhesive from the original design remained behind. But I grew to love the way it looked. I found it to be very rustic or even salvaged looking – much like a shirt from a fishing district in a dystopian society might look. 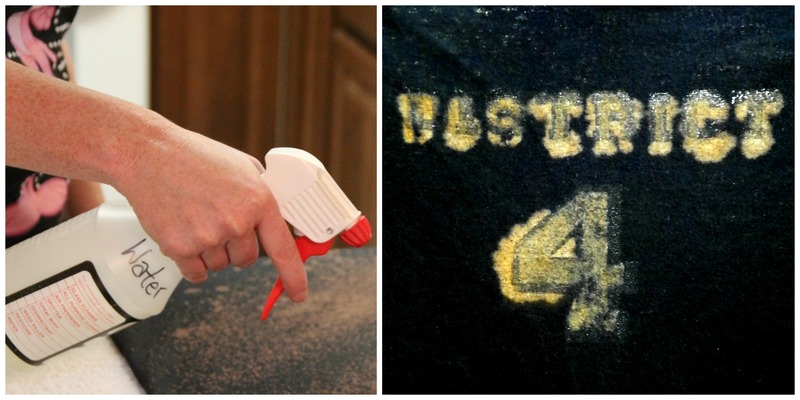 Hubby was not impressed with the results of the spray method so I used a different method with his shirt. This time instead of spraying the bleach on, I used a bleach pen to fill in the template. The result is a more defined looked which my husband preferred. Here are the results of both methods. 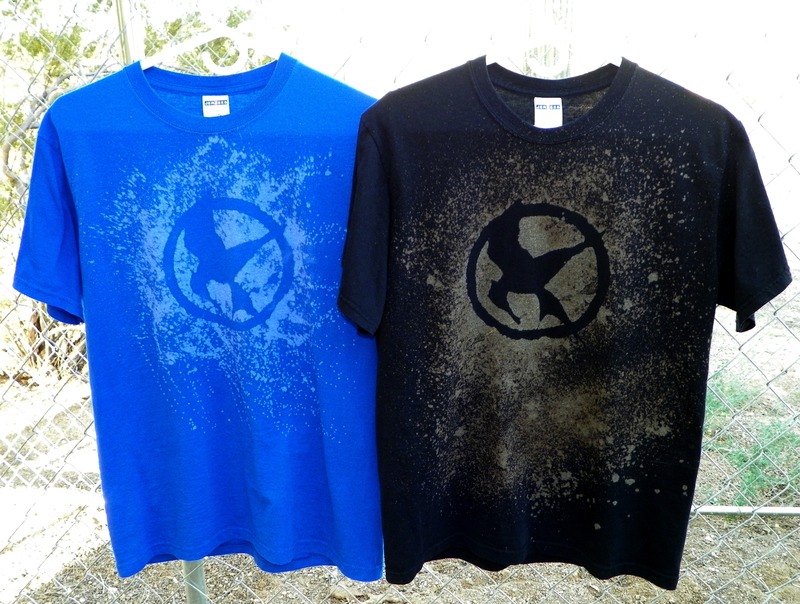 On another note, my mom told me that she preferred not to have a black shirt so I made her one in blue to go along with the Mockingjay book cover. The result is below. I think the black looks better. Which do you like? I like these changes. What do you think? Feel free to leave a comment. Very cool! LOVE the Hunger Games series!! After seeing your post title under your comment on the THG post on SITS girls, I had to see this. 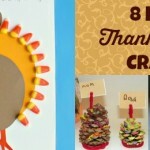 Such an awesome idea! Thanks! I noticed the SITS post about one minute after I posted this. I guess a lot of us have HG on our minds lol. LOVE it!!! 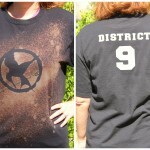 My daughter loooooves the Hunger games and is going to love doing this!! Awesome! I prefer the blue though, more vibrant and I like the bleach pen method. Thanks for te great idea. It is seriously easy! You could totally do this! Cool! I will definitely try this! Taking my daughter and friend to NYC to see the HG exhibit— making these shirts for them to wear!!!! THANKS!! !